Most of us have experienced moments of forgetfulness, trying to recall a name, the location of a lost set of keys, or the purpose for entering a room. These momentary memory lapses are normal - a natural part of being human. More concerning is when memory lapses recur frequently and begin to affect your way of life. Immediately forgetting information that has just been received or forgetting the names of familiar objects and people are examples of more troubling memory lapses, and there are a number of reasons that these may occur. The brain's functions are closely linked with levels of hormones in the body, particularly estrogen. 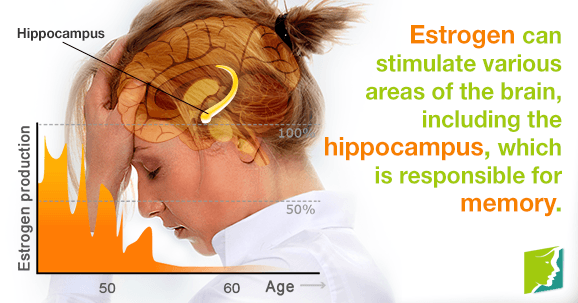 Estrogen can stimulate the brain's many functions by activating different areas of the brain, including the hippocampus, which is responsible for memory, and it increases levels of acetylcholine, a memory-influencing neurotransmitter in the brain. Estrogen also helps blood vessels dilate, which means it can increase blood flow to the brain and thereby stimulate its functions. As a woman approaches menopause, her estrogen levels fluctuate and decrease, which can cause a reduction in memory function and difficulty taking in or recalling new information. Dementia is a irreversible condition that weakens cognitive functions. Alzheimer's disease is perhaps the most well-known example of dementia. The earliest symptom of this condition is usually forgetfulness; the patient may experience difficulty performing tasks that require thought but were previously achievable, such as playing a card game or understanding a new routine. Becoming lost on familiar routes, losing things, and inappropriate social behavior derived from decreased social awareness are also common early symptoms. As dementia intensifies, so does memory loss. Severe cases of the condition involve inability to remember words, recognize loved ones, places, and objects, and forgetting how to recognize basic bodily functions, such as the need to swallow or urinate. Memory is often affected after head injuries, because there are several parts of the brain responsible for the processing, storage, and retrieval of information. Short-term and long-term memory can be affected following head trauma, although this is not to say that information cannot be re-learned after an injury. Stress is intense mental or emotional pressure that has a temporarily weakening effect on many of the brain's functions, including memory. Stress releases a surge of hormones that interfere with the brain's functions, and sleep deprivation as a result of extreme worry is likely to affect concentration levels and ability to take in and recall information. It can be difficult to distinguish between normal memory lapses and those that suggest the onset of menopause, dementia, or the presence of stress. Keep an eye on your other symptoms, and don't be afraid to consult your doctor if you or your loved ones are concerned about your memory lapses. These concerns are valid and you will be listened to respectfully, and without judgment.